And we find ourselves deposited here again in the weekend. Well, we've got a lot of reviews today, so let's not waste any time and just get to it. In this installment we have articles on: Tides of Time, Far Space Foundry, Spookies, Odin's Ravens, Xenon Profiteer, Medieval Academy, Liberty or Death, Signorie, Treasure Hunter, Abyss: Kraken, Colt Express, Tiger Leader, Heldentaufe, and Archaeology: The New Expedition. Club Fantasy is here to tell us if they agree with Gordon Gekko. Is Greed good? 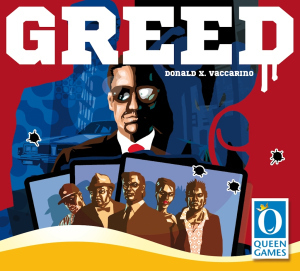 Greed is the latest offering from Donald X. Vaccarino and if you’re a card gamer you’ve most likely played and loved his extremely popular Dominion series or you may know him from the Kingdom Builder series that he also designed. The game is for 2-5 players and is set in the late 1960’s as gangs are re-emerging in a powerful way, prior to the Gun Control Act of 1968. 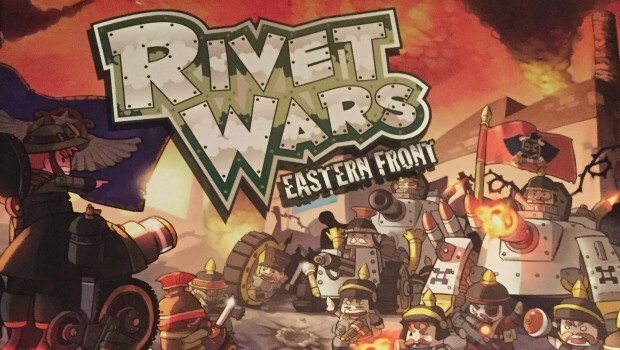 This was a Kickstarter project that funded this past March and arrived to backers over the summer, I received my copy in early July which is very much on time for a June released Kickstarter. The goal of Greed is to own as much share of the city’s wealth by any means, legal or otherwise, by the end of the 12th round. The game seats 2-5 players equally well and uses 12 card draw piles from which to draft, these piles are then passed clockwise after each draw until they are exhausted in the final round. With 80 cards in the box even a full 5 player game will not see all of the cards provided in play and this helps keep things fresh even after multiple games. Queen Games is in their final week over on Kickstarter for their Orcs Orcs Orcs board game. They're around 6x funded, so check out the stretch goals and extras. 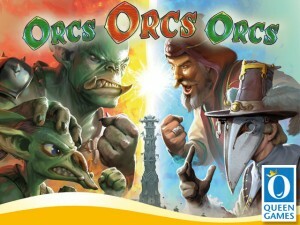 Orcs Orcs Orcs is a game for two to four players, ages 13 & up, that combines two excellent game mechanics that have not been paired before (deck building and tower defense) and has players casting spells, squashing orcs and rolling up the score in the Orc Squash Tournament. 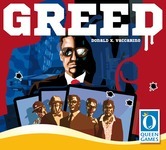 The theme and game come alive with the outstanding art and components that you have come to expect from Queen Games. Why 13& up? One of the orcs is unhappy that he is part of the Orc Squash tournament and is making a gesture that may be offensive to some people. 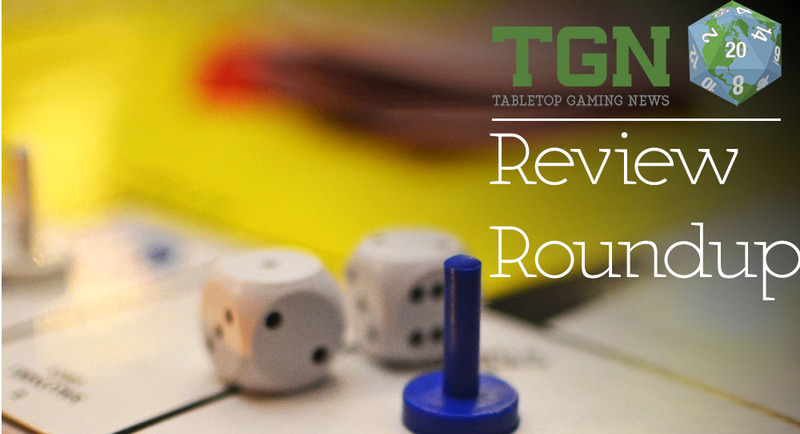 Board to Death has a new review article up. This time it's Greed. Is Greed good? Gotta read to find out. At the start of the game, each player receives a random hand of twelve cards from a deck of 80. Players draft one card, pass the remaining cards left, draft a second card, pass again, draft a third card, pass again, then the game changes; players simultaneously choose and reveal a card, carrying out its effects, then they draft another card, pass the remaining cards, play again, and so on until ten “playing” rounds have passed, at which point the game ends and players tally their holdings. 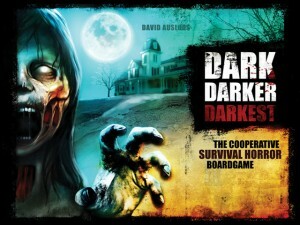 Queen Games has been running their Kickstarter campaign for their new horror survival board game, Dark Darker Darkest. A cooperative board game where 2-5 “survivors" explore the secured house of Doctor Mortimer, working to stop the zombie apocalypse.